Book now for summer.. Or - why wait? Take advantage of our low off-season rate to come visit Sequoia National Park when it is blanketed in glistening snow! While Spring has sprung in Three Rivers, Old Man Winter has settled in up in the higher elevations of the park, making for exciting, exhilarating snow play for the whole family. You can book this property instantly, or if you have questions, please feel free to text or call Robin at 559-936-8666. Crystal Cabin delivers on all fronts! Perched on Crystal Hill & surrounded by oaks, this pristine chalet-style home is perfectly situated for access to both Sequoia & Kings Canyon National Parks and the charming life of Three Rivers. Step inside & be greeted by 16' high ceilings, an open living space, an abundance of natural light, a cozy fireplace, and a gourmet kitchen. 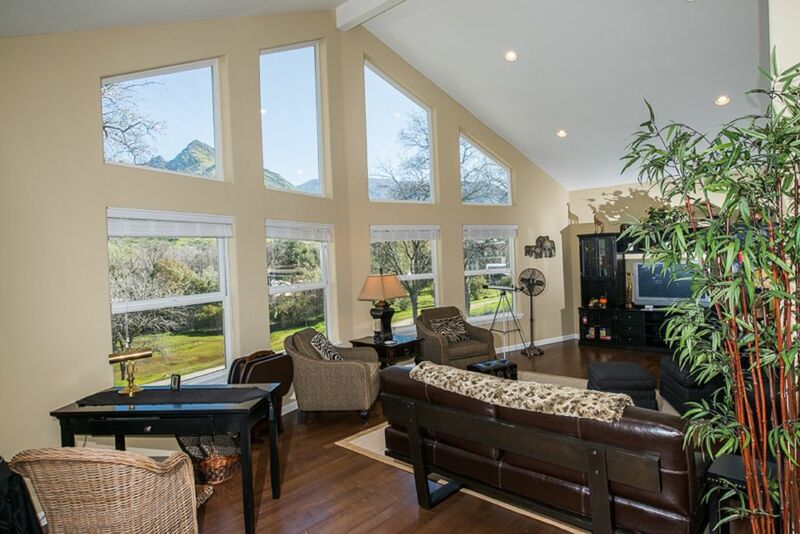 An entire side of the house encased in windows showcases the Sierras. The Crystal Cabin affords relaxing comfort at its utmost. You are invited to enjoy the contemporary furnishings and quality craftsmanship that set this home apart from the standard vacation rental. If you are looking to escape to the mountains but want to be pampered with personalized, genuine service and luxurious accommodations at the end of the day, this is the house for you! We pay attention to the details and don't compromise any aspect of hospitality. We want your stay to be perfect. Brand new furnishings and décor are in this home. High quality linens are provided in each of the 3 bedrooms. There are 2 full bathrooms, each with a tub/shower, plus a powder room. The kitchen is fully-equipped including spices, Starbucks coffee beans and everything you need to prepare fabulous meals. If you feel like grilling, there is a propane grill available. If relaxing is at the top of your list, kick back in the living area and visit or watch satellite TV, listen to music, read a good book, surf the internet, or just enjoy the fireplace. You are welcome to take advantage of the unlimited WiFi and Direct TV and there is also a landline if you have no cellular reception. The living room and master bedroom both have large screen televisions for your enjoyment. We strive to make your visit extraordinary and memorable. Welcome to Crystal Cabin! Our mom purchased this home for a family getaway and a place that might eventually be her retirement home. We have already enjoyed making wonderful memories here and hope you do too! What drew us to this home was the jaw dropping views and location. This home is conveniently situated in the Cherokee Oaks community and just a couple of minutes from Lake Kaweah and Sequoia Park. We enjoy watching the sun rise on the front porch with a cup of joe as well as just sharing time together. We love that the home is new and custom built. One of our favorite features of our home is the HUGE windows which stream in natural light. A landline is provided with unlimited long-distance calling. AT&T is the only cellular service with dependable reception. Luxurious 1500 thread count sheets make you feel like royalty! Unlimited WiFi provided. Password available upon arrival. All paper products provided as well as fresh coffee beans, tea, sugar, cocoa and a wonderful assortment of common spices/condiments. Board games for the kids! The house was clean and well stocked, the owner was easy to work with and quick to respond. It was a perfect location for us to get to both Visalia for a movie and Sequoia for sightseeing. For a party of six, the WiFi was a little slow, but we were mainly there to get away and spend some family time, so it wasn’t a bad thing. The views were gorgeous and because the houses are generously spaced apart, we didn’t hear any noise from neighbors. We wouldn’t mind coming back again sometime, especially in the summer and spend some time at the Slick Rock Recreation area just a couple miles away to play on the rocks and in the river! We spent a wonderful time at Crystal Cabin. All the booking process and check in was perfect. It was very comfortable and clean. The location is great if you want to go to Sequoia National Park. Also if you want to visit the foothills. We recomend this Cabin 100%. It was a joy hosting you this past week. I'm so happy that you got to not only experience the wonders of Sequoia, but also the breath-taking wildflower explosion in the foothills. Thank you for taking great care of the house. The house was very clean and had everything we needed for our two night stay. Location was fairly easy to find and the scenery was great. Nice touches with soaps and other ammenties. Would definitely stay here again. This house has a beautiful view. It is spotless, comfortable and roomy. It is also very quiet. I saw a huge red tail hawk and a blue heron. Robin was terrific in all aspects. Robin does a fantastic job! Her home is very clean and welcoming. Great view and lots of peace and quiet. Robin baked a yummy loaf of artisan bread left for us with a nice card upon arrival. Easy access to the park. Remember to bring chains even if you have a 4 x 4 during late fall and winter months. Not only is Three Rivers the gateway to Sequoia & Kings Canyon National Parks, it is a thriving foothill community offering a wide variety of cultural activities & events throughout the year. Come and experience the Redbud Festival, Earthjam, Jazzaffair, Team Roping, monthly 1st Saturday art exhibitions, Spring Artist Studio Tour and seasonal whitewater rafting, to name a few. Dining opportunities vary from a food truck to fine dining riverside. The Kaweah river provides refreshing relief from the summer heat with hidden swimming holes regularly frequented by the locals, but shared with our guests (sshhh). Crystal Cabin is superbly situated to take advantage of all that Three Rivers has to offer as well as a short drive to the home of the world's largest living thing, the General Sherman Tree. Nightly rate is based on 4 people. Add $20 per person per night over four. Maximum occupancy is 6 people, including children. No charge for children under 2 years old. Holidays require a minimum 3-night stay. We do not offer a cancellation policy. We encourage you to purchase travel insurance if this is a concern.